Better chalking at bouldering with POF!ZAK. POF!ZAK is specialised in bouldering chalk bags. Through our experiences with the confection of bags we were able to create the ideal bouldering chalk bag! Spacious, up standing, storage for brushes and a big front pocket makes our chalk bag very suitable for bouldering. 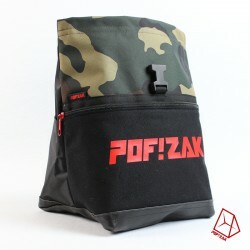 Bouldering Chalk bag, made by POF!ZAK. Handmade in the Netherlands. 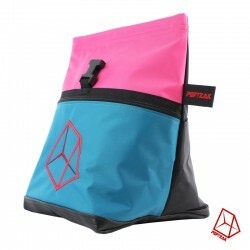 Big and sturdy bouldering chalk bag made of quality nylon. It can be rolled up like a lunch bag to prevent chalk leaking and to easily store in your bag. It has a big pocket for your accessoires and a back pocket for your brushes. We ship our orders from our warehouse/office in the Netherlands. Our team support is daily active answering your questions. You can pay with iDeal (also GiroPay and MrCash) and with PayPal. Better chalking at bouldering with POF!ZAK. POF!ZAK is specialised in bouldering chalk bags. POF!ZAK was also founded by enthusiastic bouldering people. 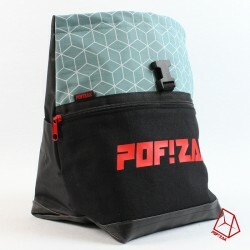 Through our experiences with the confection of bags we were able to create the ideal bouldering chalk bag! Spacious, up standing, storage for brushes and a big front pocket makes our chalk bag very suitable for bouldering. We are located in Utrecht, the Netherlands.